Vacuum carpet with a rotating brush or beater bar at least twice a week. Carpeting is one of the most popular flooring choices for living areas. This is probably because carpet care is about as easy as it gets - as long as you keep up with the vacuuming and promptly tackle carpet cleaning when the stains of life inevitably happen. Here's what you should know about carpet care to protect your flooring investment. Vacuum, vacuum, vacuum with a rotating brush or beater bar at least twice a week, more frequently in heavily trafficked areas. (Sorry!) 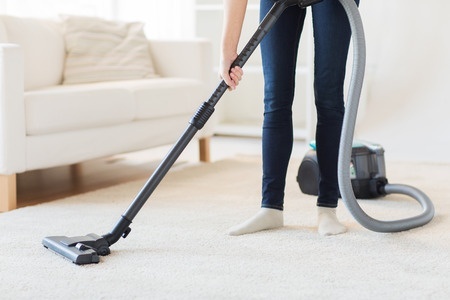 Vacuum cleaning is essential to any carpet cleaning routine. Pull the vacuum back and forth to get out embedded dirt. Change vacuum bags often and keep brushes clean. Keep curtains and window blinds closed when you're not in the room to keep the carpet from fading. Don't roll or pull things directly across carpet. Out, out #&*! spot! If you've got kids, you'll get carpet stains. And invariably those spills will be on white carpet. Most manufacturers put a stain-resistant finish on carpets, but it can only do so much. These carpet stain removal tips can help. Clean carpet stains immediately. The longer you wait, the more the carpet absorbs them. Scrape up any solids first. Then blot up stains with a clean white cloth or paper towel. Don't rub. Then begin blotting from the edge of the stain to the center. Rinse the area with cold water and blot dry. Put a stack of clean white paper towels on the spot and weight them down with a heave object for six hours to soak up excess moisture. Caution: If you don't remove all of the cleaning agent, a worse stain can result. Don't skip this last step! Also, if the stain is really serious, you might want to call a professional in right away. Home remedies may worsen the problem or even set the stain permanently.